How To Add Ads.txt File To Blogger Blog? Home > Blogging > How To Add Ads.txt File To Blogger Blog? Hey bloggers, today I come with a most discussed topic on setting up ads.txt file. If you are an AdSense publisher and running your ads code in your blogger blog or any self-hosted website or blog you may see the following action taken notice on your Adsense dashboard. Earnings at risk - One or more of your ads.txt files doesn’t contain your AdSense publisher ID. Do you know why this notice appears and want to know how to add Ads.txt file to blogger blog? Let me clear to you all. SEE ALSO: How To Keep Google AdSense Account Safe From Disabled? ADS.txt stands for Authorized Digital Sellers and the main aim of this system is to increase transparency of online advertising system. It is a secure, smart and easy method for publishers and distributors to sell their digital advertisements. Interactive Advertising Bureau (IAB) published this standard for the online advertising program. According to this standards, every websites and blogs that use online advertising program must use Ads.txt file in the root of the domain. This file should contain all necessary information about the advertising program that uses the blog and website. Hope you understand what is Ads.txt file. 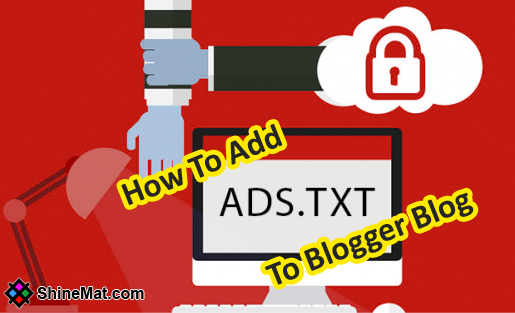 Now come to the main point how to add Ads.txt file to blogger blog that uses Adsense ads. How to solve “Earnings at risk - One or more of your ads.txt files doesn’t contain your AdSense publisher ID” warning from AdSense Account? Google Adsense is now supporting ADS.txt standard. Google says Ads.txt file is not compulsory fact for Adsense publishers but if you want to use this file for better user experience then you must put your Adsense publisher ID with the correct format in ADS.txt file. Otherwise, Adsense will stop serving ads on your site. You will see an error message on the Adsense dashboard like this if you need to add Ads.txt file. How to add ads.txt file to blogger blog that uses Adsense. Go to your AdSense dashboard. See the highlighted error message and click Action button. You will see a one-line code on the next page. Copy this code and paste it in a notepad. Now log in to Blogger blog. Go to Settings from the left side menu. Now paste the code into the box that you copy from Adsense. Finally, click Save and you are all done. If you don't see the action notification in your Adsense account you can also add the ads.txt file to blogger blog by adding the below line in blogger blog. Just copy the line and paste it "Monetization Custom ads.txt" box. Follow the above steps from 5 to 10. Replace XXXXXXXX with your own Adsense publisher ID. How to check Ads.txt file added successfully? If you see your copied codes then everything is OK. Remember, Google needs 24-72 hours to update this Ads.txt file. So, be relaxed. LOVE TO READ: Why I Choose ShineMat For My Custom Domain Name? That’s all friends. If you need any help about how to add Ads.txt file in blogger blog don’t be late to inform me. I will help you with my level best. Stay well and Allah Hafez.